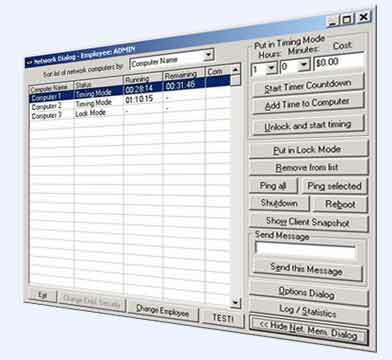 The TimeWatcher Network makes it possible to control the customer's terminals (Clients) from a central supervisor computer (Admin). The communication between the Admin and the Clients is done over the standard TCP/IP protocol. The snapshot on the right shows the TimeWatcher Network control console of the supervisor. Besides running in count-down timing mode (giving the user a certain time, after which TimeWatcher locks the computer) TimeWatcher also provides a count-up timing mode. In the count-up timing mode, the supervisor just unlocks the computer and the customer can use it as long as wanted. When the customer is done he just contacts the supervisor, who locks the computer over the Network. After locking, TimeWatcher displays the exact usage time, for which the customer can be charged. Whether you prefer to have the customers pay before usage or pay after usage, both approaches are supported by TimeWatcher.